We're preparing the next generation now! We help keep alive the legacy of the Tuskegee Airmen -- who helped integrate the military and our country -- by providing motivation, access and scholarships to assist financially and academically deserving students in their pursuit of a college education. By supporting our work, you are both honoring the legacy of the Tuskegee Airmen and ensuring the future of many young people who are trying to bridge the gap between high school and college. The Tuskegee Airmen knew personally how difficult this transition can be, especially for young people from low income families, many of whom don't have a history of being able to go to college. That's why they created the Tuskegee Airmen Scholarship Foundation in 1978. In keeping with the Airmen's history, we emphasize students who want to pursue careers in aviation, aerospace and science. 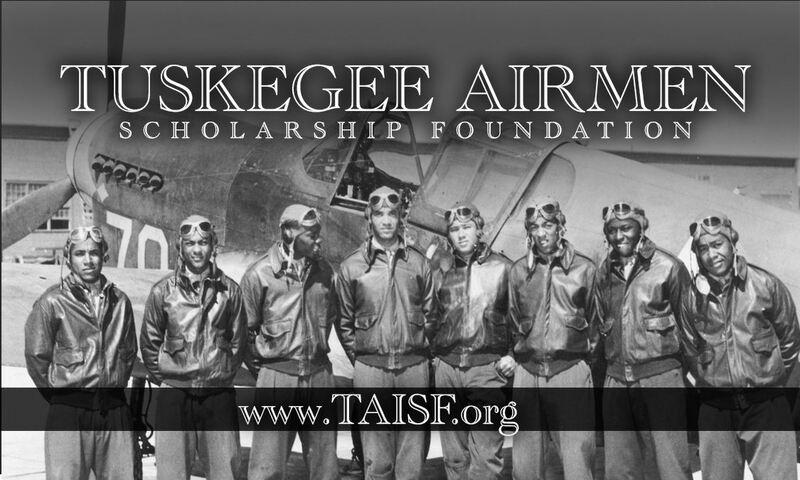 Continuing a legacy of courage and commitment to issues of social justice and equality, the Tuskegee Airmen created a fund aimed at providing scholarships for deserving and often financially challenged students, as well as the children of servicemen. These undergraduate scholarships help cover the heavy financial burden on students entering college. They are offered to African Americans, Hispanics, Asians, other ethnic minorities as well as other applicants without regard to race. We provide $1500 scholarships to academically and financially deserving young people to help them go to college. We also provide mentors and educational advocates to help them stay and thrive in college. We emphasize students pursuing careers in aviation, aerospace and science technology, in honor of the living and decreased members of the Tuskegee Airmen. As Nelson Mandala said, "Education is the most powerful weapon you can use to change the world." The Tuskegee Airmen greatly valued education, knowing it was a big reason they were able to become decorated airmen and help integrate the military and the country. They also knew that the transition to college can be extremely hard for many young people, especially those from lower income famililies. This is why the Airmen focused on education when they created a foundation to carry on their legacy. Our scholarships not only help pay a young person's college expenses such as tuition and books, they also give them a financial motivation to get to and stay in college. Our mentors and educational advocates also help them navigate the many challenges of college. Given the history of the Tuskegee Airmen, we emphasize students from lower income families who want to pursue careers in aviation, aerospace and science. We are also motivated and guided by the legacy of the Tuskegee Airmen, a few of him still sit on our board. We have provided more than 1300 scholarships to help deserving young people go to college. We've also provided many of these young people with mentors and educational advocates, helping them stay motivated and graduate. TASF was started by Tuskegee Airmen in 1978 and we've been guided every since by their legacy of courage, leadership and willingness to overcome barriers to achieve their dreams. Many of the students we've supported have told us how motivating this legacy was for them as they pushed through their own barriers to succeed in school and in their careers. A few Tuskegee Airmen still serve on our board, along with community leaders and corporate partners such as Boeing. They keep TASF motivated and accountable. We provide 40 scholarships each year. 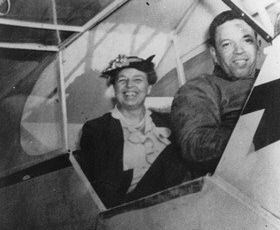 A Tuskegee Airman pilot with Eleanor Roosevelt. We focus on aviation, aerospace and science. The Tuskegee Airmen played a critical role in helping integrate our military and country.